Never has a farm vehicle been so versatile than a telehandler, for use around the farmyard or on the building site. A telescopic handler, or telehandler for short, is similar to that of a warehouse forklift, but thanks to the telehandlers design in both its power over rough terrain, it can be used for all heavy lifting on the farm and out on the muddy construction site. If you're already an owner of a digger or a tractor with a front loader, than you may feel there's no need to upgrade, but you'll be wrong. In a toy telehandler you enjoy complete control of your heavy load with amazing reach from the telescopic arm - something that is incapable from most farm vehicles. You are also permitted to drive your telehandler on the road (pretend road that is) providing you have a UK driver's license. How does a telehandler work? A telehandler is a vehicle for use over rough land like a building site or over farm fields. All models have an arm that reaches as much as three times its original length, allowing the driver - who is also the controller of the telescopic arm - to lift, stack and store heavy items. What can it lift and carry? Absolutely anything, but sometimes a little imagination is required on the controllers part - thanks to a range of interchangeable add-ons. But if there's something to difficult to lift, why not strap it on instead, when a certain attachment is not available. Example items a telehandler might carry around on the farm includes hay bales, sacks, pallets and machinery. And example loads on the building site includes pallets of bricks, roof beams, scaffolding and anything needed lifting high or moved generally around the site. Here in the UK the single biggest manufacturer of telehandlers is the world renowned JCB, who produce telehandlers for large scale construction and agriculture work. To smaller, compact models for those areas around the farmyard and building site with limited space. 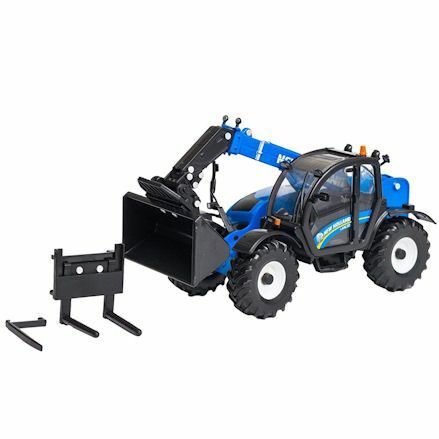 Toy makers recognise the full learning experience from toy telescopic handlers thanks to their full range of replica telehandlers that are sure to both educate the child in farm machinery and its many uses. For a medium scale model telehandler you'll find Siku produce a small but fine model. But in Britains you'll find a brilliant range of replica die-cast models from all major manufacturers - favouring JCB as the UK based producer. But if you need large telehandler with features easier to reach and control, than look to Big Farm or Bruder in their large 1:16 scale. Here's a selection of what we consider our best toy telehandlers for sale in the UK. 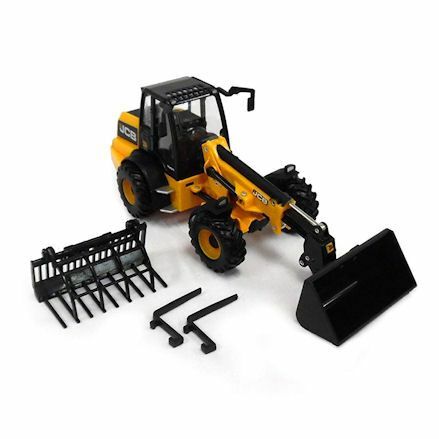 This Britains (42555) JCB TM Loader is as close to what you would expect a telehandler to look like, but with accessories included, so make this your first choice when selecting a 1:32 scale model. As you would expect the boom has a long reach, with free rolling wheels and a detachable driver's cab. Since retired but still remains on the market, here's a diecast telehandler though small in scale, still packs lots of features and functionality. Our second favourite, but a very close replica to our first choice, you may think why bother. Well actually we still hugely favour 1:32 scale models because they have a bigger range in regard to extra vehicles and accessories. But we do love this striking blue Britains (43085) New Holland LM74S. New Holland are not really known for there other farm machinery, but biy don't they make a nice one in, beautifully replicated by Britains in 1:32 scale. When were not raving about Britains we're a huge fan of Bruder in a large 1:16 scale. This big replica Bruder CAT telehandler has it all; real steering, access inside the cabin, fully functioning boom and the option to add attachments when needed. We like this one best because its a name most people will recognise, and will do anything all Bruder models will do, but in the JCB branding. 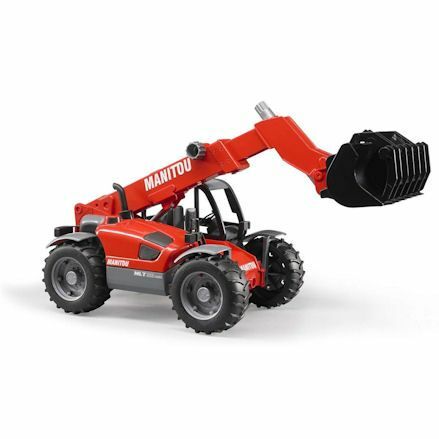 Moving onto a manufacturer you may be unfamiliar with, but in the telehandler industry Manitou are a big player in producing heavy duty machinery. 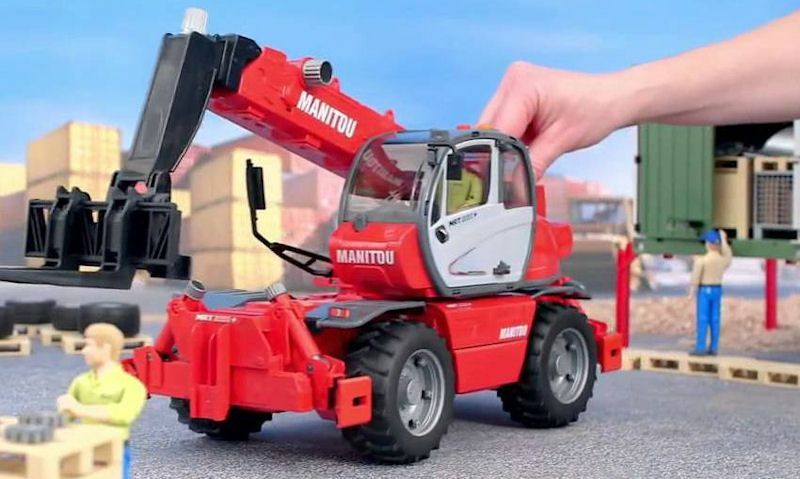 This Bruder (02125) Manitou Telescopic Loader is an exact replica from the functioning telescopic arm to the detail inside the driver's cabin. Bruder's Manitou telehander is packed with features but most play with come from the telescopic arm, such making sure there's load to pick up and pack away. We do tend to favour Bruder over Big Farm but we must give Britains Big Farm their due credit on this one. 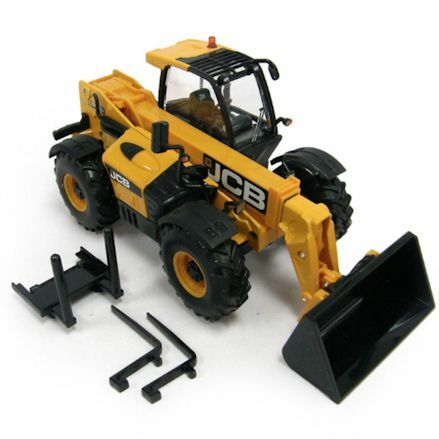 The Britains Big Farm (42873) JCB Loadall in 1:16th scale is a beauty, with a replica body, working telescopic arm - as standard - rolling wheels and unlike Bruder, comes with two attachments and a pallet. 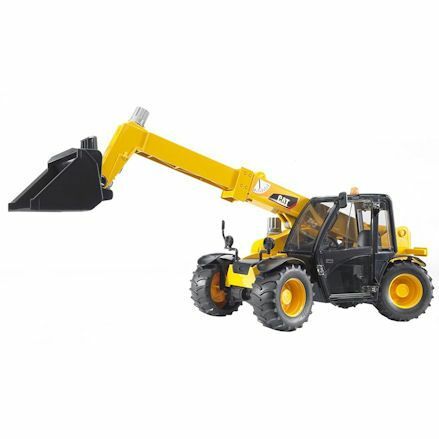 Go for the Britains JCB telehandler and your fit right in as you manoeuvre around the farm o on the building site.